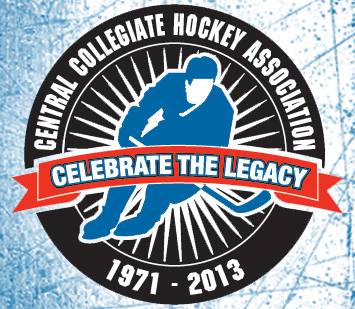 The Central Collegiate Hockey Association hosted their final league awards show at the Fox Theatre Friday evening, to honor the best players from their “Celebrate The Legacy” season. Here are the award recipients, with additional information on the Michigan connections who were honored in downtown Detroit. The accolades continue for Rochester native Jacob Trouba. The Wolverines’ freshman defenseman picked up the Best Offensive Defenseman Award Friday night at the Fox Theatre, a week after he was named to the CCHA All-Conference First Team. The Compuware and U.S. National Team Development Program alum has excelled in his first collegiate season, recording 12 goals and 15 assists for 27 points in 35 games – the most of any defenseman in the CCHA. No other defenseman had more than five goals. Notre Dame goaltender Joe Rogers, a Marysville, Mich., native, was named the 2013 recepitent of the CCHA’s Terry Flanagan Memorial Award, given to the player who best demonstrates perseverance, dedication and courage while overcoming severe adversity. Rogers, who won a national title with Belle Tire in 2007, was born without a full right hand – something that has never stopped him from catching the puck. Rogers has also served as a role model for Elliot Huels, a youth hockey player from Kansas with an underdeveloped left hand. The two communicate on a regular basis, despite Rogers’ hectic student-athlete lifestyle. Notre Dame alum Erik Condra, a Trenton native, won the award in 2009. Western Michigan forward Dane Walters took home the equivalent of the Selke Trophy – the Best Defensive Forward Award. While he picked up 12 goals and 12 assists, Walters made just as much of an impact in the defensive zone. The senior captain was a +5 on the season, and played a big role in a stellar Broncos’ penalty-kill unit that killed off 85.3 percent of the opposition’s man-advantage opportunities. Walters won 66.7 percent of his face-offs on the season, and he blocked 24 shots. Perhaps the most highly-touted, collegiate free agent in the country took home Best Defensive Defenseman honors for the second straight season. Not a bad way to help write the CCHA’s final chapter for Western Michigan’s Dan DeKeyser (Clay Township). DeKeyser edged out Bowling Green’s Bobby Shea and Miami’s Steven Spinell to earn the honor in back-to-back seasons. The 6-foot-3 junior defenseman recorded 12 points in only 27 games this season from the back end due to injury, but he was also named to the CCHA All-Conference First Team. Livonia native Riley Barber, also a sixth-round draft pick of the Washington Capitals in 2012, captured Rookie of the Year honors Friday evening, a nomination his coach Rico Blasi called “well-deserved.” After being named the CCHA Rookie of the Month in October and November, there’s no doubt Barber probably could have won it every month with the way he consistently stepped up against the competition. In his first season, Barber amassed 15 goals and 23 assists for 38 points in 37 games for the RedHawks, leading not only rookies but all CCHA players in overall scoring. Previously, the freshman forward spent time with the U.S. National Team Development Program, as well as the 2013 U.S. National Junior Team, where he helped his country take home gold in the IIHF World Junior Championship from Ufa, Russia this past December. Western Michigan’s Brett Beebe captured the Michael and Marian Illitch Humanitarian Award (shared with Kaare Odegard of Alaska), for his work off the ice with the community. The Broncos’ senior forward was also named as a finalist for two country-wide awards: the Lowe’s Senior Class Award – awarded to student athlete who best excels both off and on the ice – and the BNY Mellon Wealth Management Hockey Humanitarian Award. While he didn’t find the scoresheet often, he certainly did with the community off the ice. As if finding out that you’re a finalist for the Hobey Baker Award isn’t enough for one day, Austin Czarnik also found out that he’s the CCHA’s Player of the Year. The Washington, Mich., native recorded 14 goals and 22 assists for 36 points in his sophomore season at Miami, leading the RedHawks to the CCHA regular-season title. The U.S. National Team Development Program alum was named to the CCHA All-Rookie Team last year; this time around, he was a All-Conference First Team selection and now Player of the Year. myself ponder a tiny bit further. I really enjoyed every individual component of this post.